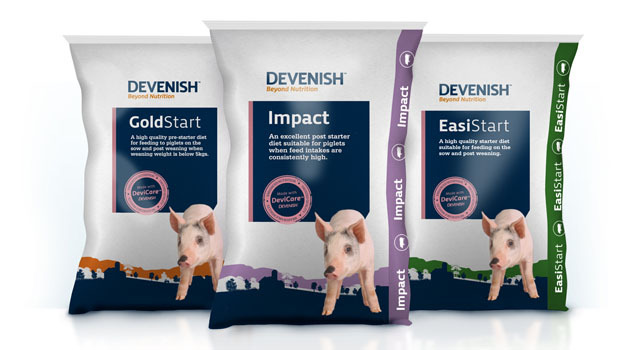 Devenish Nutrition are a market leading agri-technology company, that specialise in developing and providing nutritional solutions to challenges faced by livestock producers across the globe. As part of a larger branding project, we were asked to specifically look at their packaging and provide a design solution which would elevate their market leading status and bring the range together with a consistent look and feel. A key part of the new packaging design is the introduction of a graphic agricultural landscape, which provides a dynamic element to the pack whilst grounding it in a familiar environment. Colour-coding through the landscape and colour blocking on the sides of the bags allows for the different products to be easily recognised in a warehouse whilst giving each product brand a degree of personality in its own right. The design is completed with a visual of the animal range in question to allow for quick reference in product store. Finally a quality seal device was developed to represent the IP that is present across certain products under the ‘DeviCare’ offer.